From 1887-1895 Thomas Larsen from Løkken hotellet took over the hotel via an outlay deed, though with Wilhelm Kypper as tenant. Thomas Larsen had started as a fisherman, but went over to the trading road where he in years drove independent trade in Norway. He had great success and stopped with leading his ships and went ashore to steer the business there from. He was the last of the great matadors among tradesmen. In the early 1890s Kyppers Hotel had a stable tenant named Lauritz Olsen (born in Hjørring d. May 17, 1868). 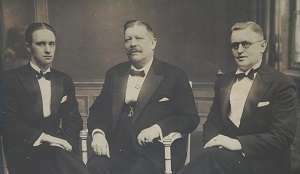 He was a former competitor for then-Prime Minister Rottbøl, Børglum Kloster. As a competitor he made kr. 150, – per year, but he had to pay kr. 1.200, – per year for housing lease on Kyppers Hotel. Lauritz Olsen emigrated a few years later to Norway, where he was for a time in the brewing industry and horse trader, was hotelowner in Arendal, millionaire, and an esteemed and beloved citizen. Right up to his death Friday December 28, 1956 (88½ years old) he got moist eyes when the conversation went on horses. 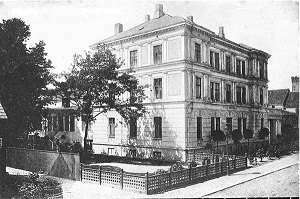 1906: G. Clasen’s widow: Bodilsine Martine Clasen sell the hotel to a consortium consisting of: S. R. Dejgaard, H. Mulbjerg, Mads Strørup and Christen H. Torning. In 1910, the Consortium sell the hotel to J. Chr. Thorup, and in the following year, in 1911, J. Chr. Thorup sells the hotel to N.C. Thygesen. 1937: Gunner Bach takes over the hotel and rename it to “Missionshotellet”. 1947: Helga and Holger Jensen buys the hotel and renames it to the “Hotel Phoenix”. 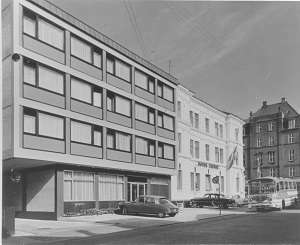 1967: The hotel expands with 27 double rooms and two party rooms. 1994: Birgitte Messmann takes over the hotel, and today she runs it jointly with her brother Henrik Messmann.